The vital research helping our most vulnerable. The excitement and anticipation experienced by expectant parents throughout the nine months of a baby's development in utero is a special and unique time. 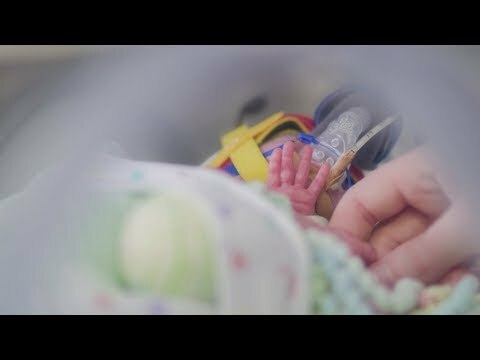 But when a baby doesn't reach full term and unexpectedly makes a premature entrance into world, things can often be frightening for parents as they watch their child fight for life. Professor Peter Dargaville is on a mission to change the lives of babies across the world. He is searching for methods to give premature babies born with breathing difficulties a better chance. Professor Dargaville holds a clinical research role at the University of Tasmania’s Menzies Institute for Medical Research and the Royal Hobart Hospital. While he is involved in several research projects, his focus has largely been on two themes that have made a big impact in the lives of tiny babies. For more than a decade, Professor Dargaville has studied babies who are in need of continuous positive airway pressure (CPAP), a form of breathing support commonly used in premature babies. While CPAP is usually beneficial, sometimes more support is needed, in particular a medication called surfactant, which is delivered into the lungs. Up until recently, administration of surfactant has required a complex and difficult procedure where a breathing tube would be inserted into the lungs. Not satisfied with this invasive and problematic form of patient care, Professor Dargaville created the Hobart Method. The Hobart Method is a highly effective and less invasive procedure which allows surfactant to be delivered into the lungs without harm. This is done using a small tube or catheter. Coming towards the end of a six-year clinical trial, evidence and findings are still being gathered to see how much of an impact this form of therapy can have. But, in advance of the results of this trial, the Hobart method is already being used widely, both within Australia, and internationally. At one point in medicine, premature infants were supported in a very gentle manner, and then we saw this shift to something much more invasive, leaving babies with scars and further complications. I'm trying to make their care as simple and gentle as possible, and the Hobart method is one way to try to achieve that. Preterm babies can also be at risk of receiving too much oxygen, leading to various eye diseases, or too little oxygen, which can be fatal. While the idea for automated technology to control oxygen levels has been in place since the 1940s, the regulation of oxygen concentration has remained in the nurse's hands. Collaborating with some of the University of Tasmania's leading engineers, including Dr Tim Gale from the School of Engineering and ICT, Professor Dargaville’s research team collected more than 4,000 hours of data from preterm babies to better understand breathing and oxygenation patterns. With engineering as the backbone of their research, an algorithm was created using a proportional integral derivative control system. This is a system similar to the functionality of cruise control. They developed a system to control oxygen concentration around the clock, sensitive to the need for more or less oxygen to be delivered. Clinical studies have been conducted in preterm infants at Royal Hobart Hospital to gauge the effectiveness of the new technology and the results have been very positive, with a 20-25 per cent improvement in time with satisfactory oxygen levels compared to standard control solely by bedside staff. We're really looking to the future with this technology and are working on a partnership with a global ventilator company to embed our algorithm into their devices. “Through commercialisation of this technology we would hope to see neonatal intensive care units around the world have access to our control device to give their patients the best outcomes." The positive outcomes preterm babies with respiratory complications in Australia have experienced through these medical advances has been significant. And Professor Dargaville isn't stopping here. Seeing a need to bring these technologies to developing countries, he is now working on creating devices that will be financially accessible in low and middle income countries. My aim is to do the greatest good where there is the greatest need and developing countries are where the most preterm babies are born and cared for in our world. “In some hospitals around the world, there is one staff member looking after 10 babies and, in some cases, parents are monitoring and adjusting their child's oxygen levels," he said. "If we can bring these new findings to such settings, we really have the opportunity to save many lives." Find out more about the College of Health and Medicine here. Breakthrough technology designed to reduce infant mortality licensed by UK firm.